What to say of the bike that has completed a testing clean sweep, showing itself to be fast, consistent and, ultimately, adaptable to all conditions? 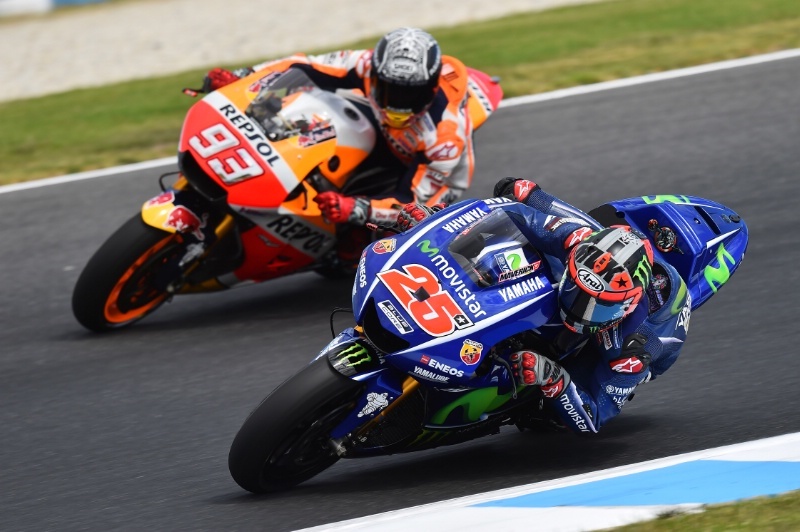 Anyone that believed Jorge Lorenzo's - three times a world champion in Yamaha colours - absence would be felt had changed their tune by the first afternoon of the preseason campaign. Since then 22-year old new signing Maverick Vi?ales has only got stronger. We knew he was good. But this good? Even Vi?ales' most ardent followers have been taken aback at his speed and consistency in the winter months. Four official tests in, and four fastest times. By the end of it all the 22-year old had, among others, rivals Valentino Rossi and Marc Marquez scratching their heads, contemplating how he had been that much faster. As he will know, testing is one thing, racing another. But it could be argued that a rider hasn't started the season in this kind of form since Max Biaggi swaggered through the Suzuka paddock in 1998, a string of broken lap records from tracks around southern Europe lying in his wake. We all know how that spring-time weekend under the Japanese sun unfolded. Bearing Vi?ales' performances in mind, it has been puzzling to observe Rossi and his winter of discontent. Not known for attacking the preseason with relentless intensity, the Italian often prefers to bed himself in, his training programme ensuring he is only physically ready for race number one, not test number one. Although he believes his team-mate's riding style is more in line with his own means, than ex-partner Lorenzo, Rossi hasn't quite caught the knack for riding the 2017 M1 at its full potential. The Italian has been in a variety of countries, time zones and climates promoting the Yamaha brand since the turn of the year, and that has surely played, at least, some part in the 38-year old's preparation. Perhaps the bottom line is he cannot understand the speed of Yamaha's new arrival. In Vi?ales' hands, the 2017 Yamaha M1 has shown itself to be, perhaps, the grid's finest all-round package. With that in mind, you wouldn't expect Rossi - a real racer and a 'Sunday man' if ever there was one - to be trailing far behind for long. For a rider that won his fourth ever grand prix, triumphed in the first ever Moto3 race and climbed the top step of the podium after just his second Moto2 bow, Vi?ales was always going to soar early into his Yamaha career. If history taught us one thing in recent years, it is that this kid can learn. And learn fast. But, along with considering workings of a new bike, there was a completely new crew in front of him - including crew chief Ramon Forcada -, listening and attempting to understand his every word. With that in mind, it's hard to imagine the 22-year old's preseason going any better. Brimming with self-belief, he set about his opening months in Yamaha colours with a typically clear-minded strategy; outpace your team-mate first. Working on race pace could wait until after. Yamaha's private test at Sepang in November was a case in point. "Honestly I was all the time trying to make the lap time," Vi?ales said, hinting that he had not only outpaced Rossi, but done so by some margin. "I was not focussed so much on the work." Could the 2017 title be between these two men? pic: Gold&Goose. And over the nine further days of testing in 2017, the consistency gradually came. Admittedly he was not always as relentlessly constant as Marquez. That was, until the final shakedown in Qatar. A 20-lap run caught the eye, not only for its string of laps, varying only on occasion, when he found the track crowded up ahead. But toward the end, Vi?ales got faster. Then faster again. "I'm not fully satisfied with my pace," said Andrea Dovizioso, a specialist around Qatar, after the final night's testing. "Especially when I see what Maverick's done. He's much faster than everyone and I think he could have been even faster." The Yamaha's electronics are, he says, a considerable step up on those he used at Suzuki. And the grip on corner exit is to his liking too. It is tempting to think Vi?ales' new, exalted position as centre of the MotoGP world would lead to a changing of his personality. But the Catalan has been more generous with his time than ever to detail his feelings with the M1, his team and his progress. Performances have suitably impressed Yamaha boss Massimo Meregalli. "The way that he is used to answer to the crew chief, he was really sure. [He could say] 'That is better, that is worse.' And that really impressed me. The direction was practically the same as Vale. For me he could be hiding the pressure because now we haven't seen it, we haven't felt it. But on the first day he jumped on the bike Jorge [at Valencia] won the race the day before. He is ready." At Yamaha's team launch in January, group leader Kouichi Tsuji spelt out one of the factory's aims for the year ahead. "This year we're developing the bike to our philosophy. The first step is very positive to get back Yamaha's character." As we know, that character includes sweet handling, smooth, applicable power and an ability to attack quick corners at pace. There was a sense that Yamaha had strayed from this come the end of 2016. The factory's engine issues at Mugello caused engineers to down-tune the engine ever so slightly. And the new parts brought mid-season, did nothing to add to the overall package. In essence, the M1 stood still from race one onwards, while Honda in particular, kept gaining strength. 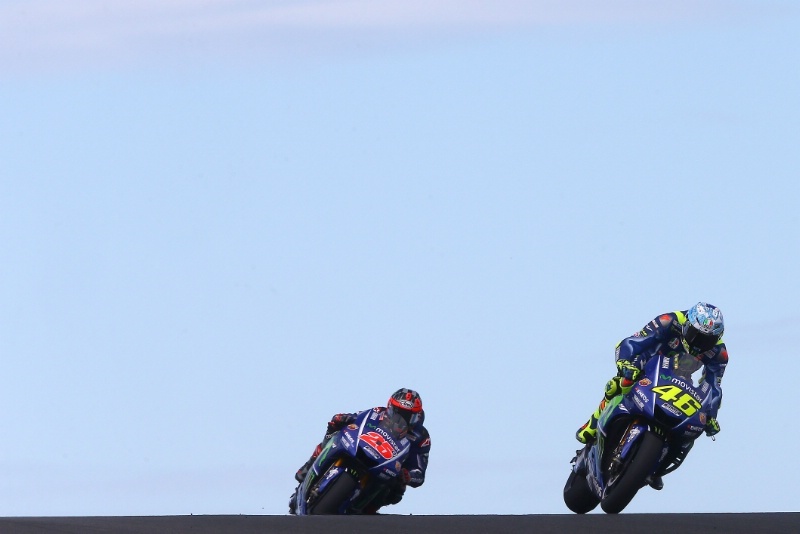 Rossi leads his new team-mate over Lukey Heights at Phillip Island. pic: Gold&Goose. "In Japan they worked hard and made a better bike compared to the prototype we had in November," Rossi said at Sepang in February. "The engine, we work a lot on the electronics and in terms of chassis, this is the same. Today, the first touch [of the throttle] was a good feeling. We had good speed and good acceleration." So, higher top speed. Better acceleration. It all sounds good. Maintaining that pace over race distance was a big priority, though. And, from Vi?ales' side at least, it appears Yamaha has that too, based on showings at Phillip Island and Losail. Until now, both riders have followed a similar development path, with a final decision on choosing the newest of two chassis coming on the penultimate night in Qatar. "[Engineers] Worked on chassis, electronics, drivability," says Meregalli. "The problem is that if you look at the bikes, it looks always the same. We were not expecting that they could make such a big improvement, when you think that last year they tried but they never succeeded with a big step. They did. They did it during this winter time." If this really is his final Yamaha contract, 2017 will be Rossi's penultimate grand prix campaign, meaning the 38-year old has just two attempts to claim that all-important, illusive tenth world title. Not that he has sounded the alarm publicly but time is running out. It could be argued the Italian's tactic has been to watch Vi?ales hog the glare of the spotlight since January, and observe how it unfolds. Rossi admitted he was too filled with suppressed rage at the beginning of 2016 to ride at his best, and crew chief Silvano Galbusera has noticed a calmer presence in the winter months this time around. The final evening of testing didn't bring the gains Rossi had hoped for.. pic: Gold&Goose. It is believed that, with Vi?ales' arrival, promotional duties are now split more evenly between the pair than before with Lorenzo. Hence Rossi's busier winter schedule. A nuisance perhaps in the winter months but Rossi will ensure that, physically, he is as prepared better than ever for race one. Long time mechanic Alex Briggs hasn't seen that affect his incessant, evergreen drive. His rider "is as motivated as I've ever seen him." Still, Rossi wasn't anywhere near Vi?ales on the final night of testing. Issues with Yamaha's front end when braking and pitching into the corner persisted. "We are very worried," he said. Tellingly, he also pointed to the speed at which Vi?ales' crew are able to get the M1 up to speed at a new location. "It looks like with the bike we have a good potential, because Vinales is very, very fast. But I think that him and his team are able to understand in a shorter time the way to make this bike at the maximum and we are a bit in delay," he said on the final night. A veiled kick up the backside to his own crew perhaps? All considered, it would be foolish to count Rossi out of the title fight. And he may yet use Vi?ales' simmering rivalry with Marquez to his own advantage. Seeing how this inter-team relationship plays out will surely be crucial in deciding how the MotoGP title is decided. One thing is clear. Yamaha wants its championship back.